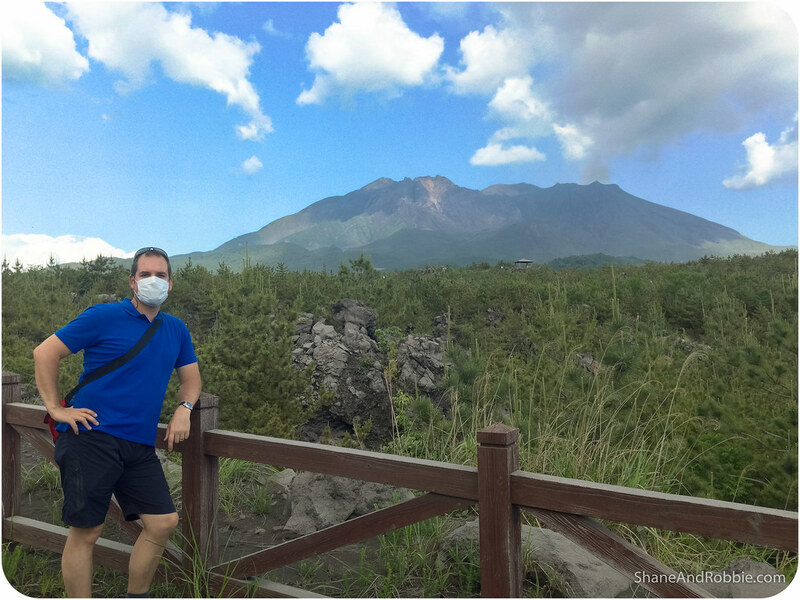 We were so entranced by Sakurajima,, the active volcano just 2km across the bay from Kagoshima, that we decided to spend today getting better acquainted with this noisy mountain. It was awe-inspiring, getting close to such an incredible force of nature. We heard and felt the mountain belching out ash and gases almost continuously, which was amazing. Less amazing was all the ash we had to walk through and ended up covered in. All our clothes were grey and after a day on Sakura Island we had to wash our hair, scrub out our ears, and dust off all our gear. How do the people that live on the island put up with it every day?! Given it was such a perfect day, and the sheltered waters of Kinko Bay were nice and calm, we chose to start out with a short cruise around Kinko Bay that showed us the mountain from a few different angles. 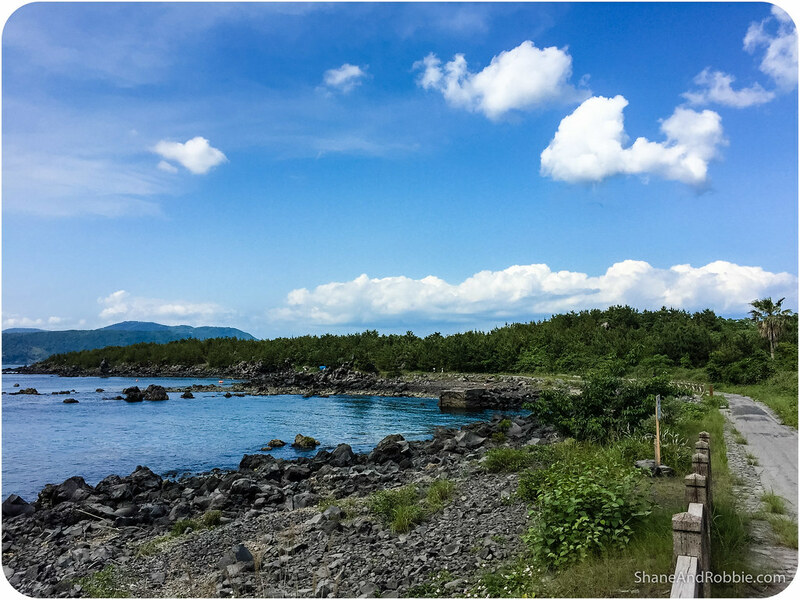 When we managed to tear our gaze away from Sakurajima, the waters of the bay were the most beautiful blue, and the green, lushly forested mountains all around us made for a great backdrop. 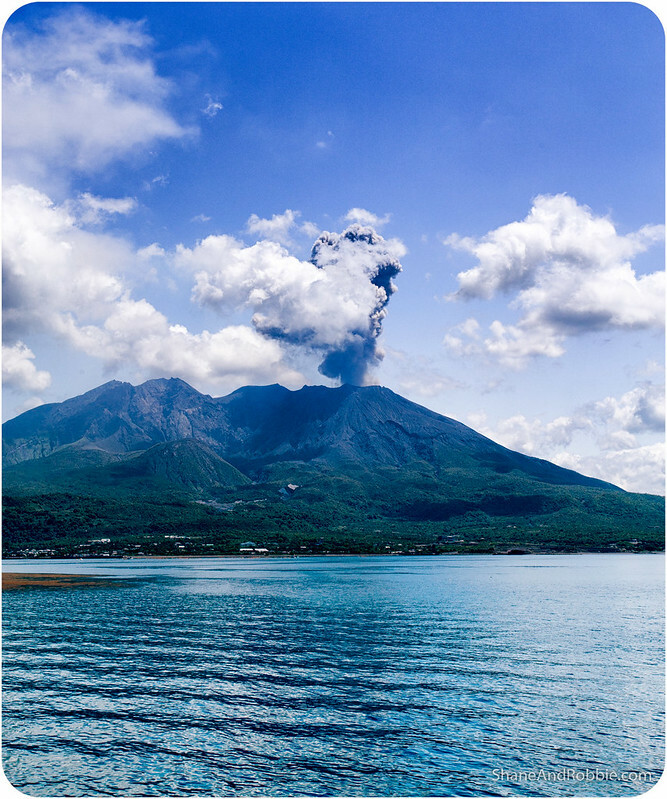 While we were out on the bay the volcano gave an almighty belch and shot up a huge plume of ash and gas (we found later by reading the Japanese Meteorological Bureau’s webpage that the plume reached 4.5km in the air). It was spectacular, but quite scary – especially when it started raining little bits of pumice all around us! The guide on the boat was telling us that sometimes there are golf ball sized bits of pumice that get shot out. Pumice isn’t too heavy so it probably wouldn’t kill you, but a golf ball sized lump would still sting if it got you! 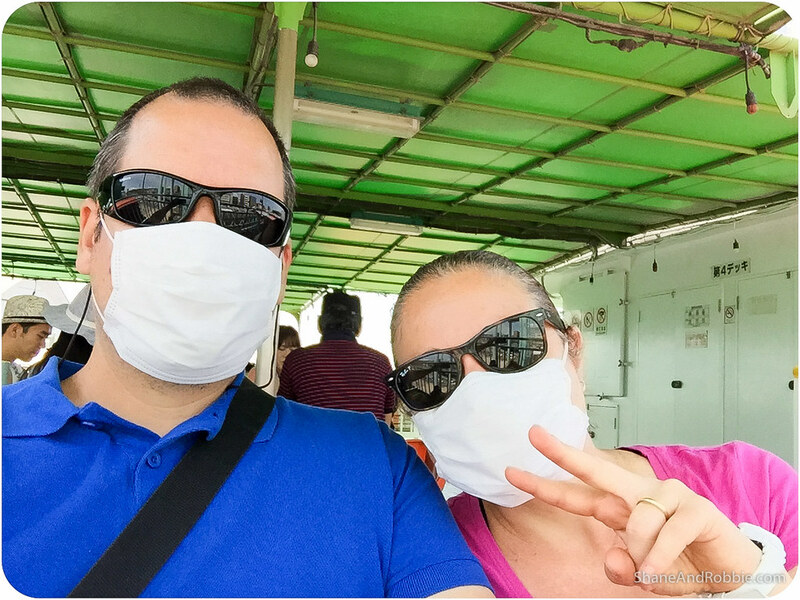 Given the amount of ash that was being expelled from Sakurajima today, we pulled out a couple of the face masks you often see Japanese people wearing. They are simple cloth masks designed to stop you breathing in our people’s germs, pollutants, and (today), volcanic ash. Thank goodness we took the masks – the amount of ash in the air after the big explosion was incredible, and a lot of the people around us who didn’t have masks were soon coughing and trying to cover their noses and mouths with hankies, shirts, and whatever else they had handy. 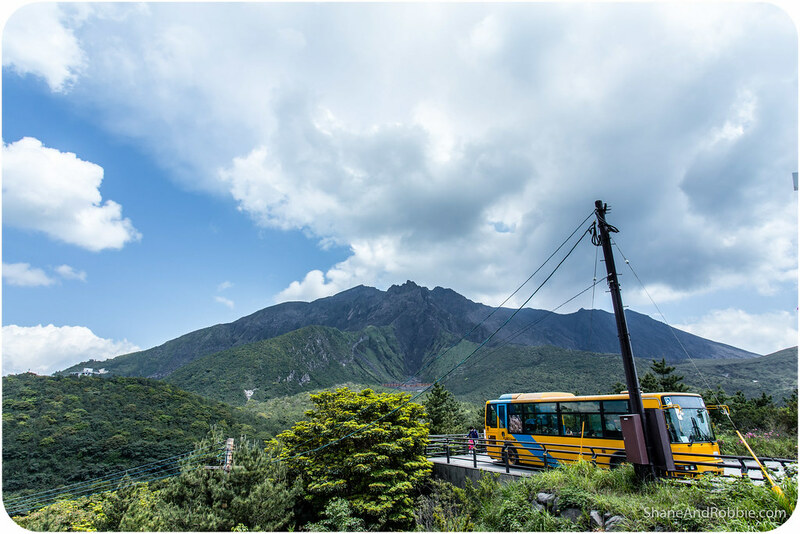 We learnt that Sakurajima’s crater is about 50km around, and that the mountain used to be around 1,600m high – the top 400m or so got blown off in a big eruption some 30,000 years ago. 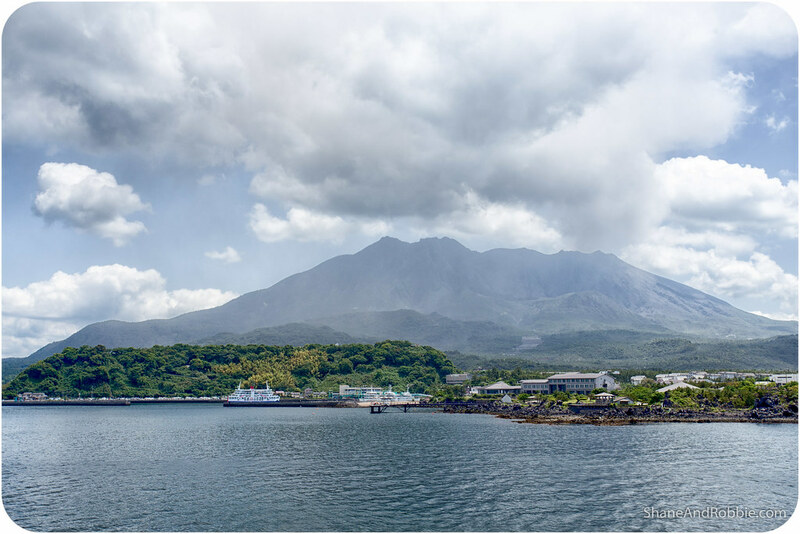 Sakurajima’s last really big eruption was in 1914, when it spewed out lava for months on end, destroying hundreds of homes and farms*. 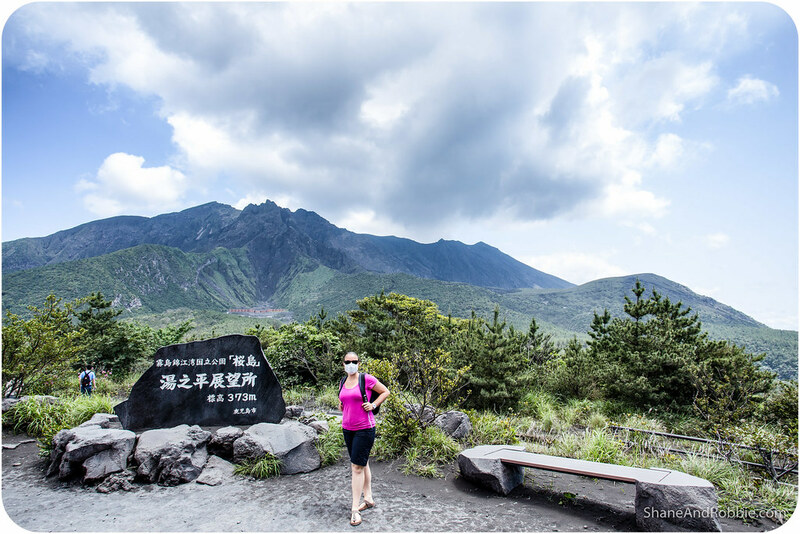 Sakurajima literally means ‘cherry blossom island’, but it’s not technically an island any more as, during the 1914 eruption, a lava flow joined it to the mainland on the Western side. 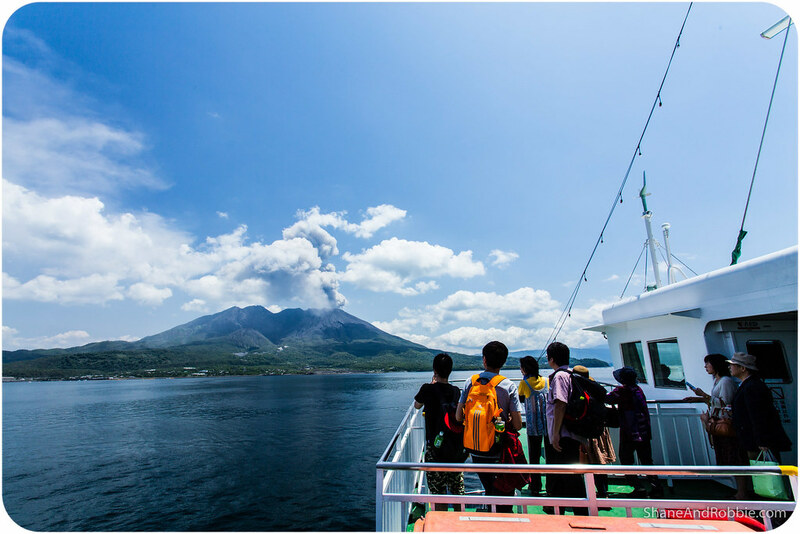 While the lava stopped flowing long ago, Sakurajima has been erupting almost non-stop since 1955. *There are about 7,500 people who live on the island today, mostly farmers who use the rich soil to grow yams. 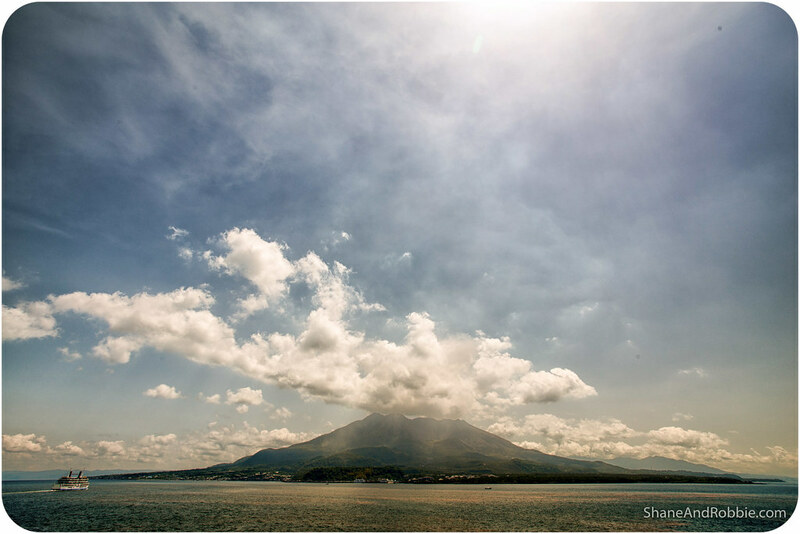 Due to the volcanic activity, you can’t climb to the top of the mountain*, but there is a road all the way around the island, and several lookout points that provide great views of the volcano. It’s about 36km to go right around the island, which was a bit far for us to walk, so we used the local tourist sightseeing bus instead. *Sakurajima is currently at a Level 3 (orange) alert by the Japan Meteorological Agency, signifying the volcano is active and should not be approached. It is currently one of 3 volcanoes in Japan with this status. Mt Aso, that we went to see the other day, is at Level 2 (yellow) alert. The sightseeing bus took to us a to a few of observation points around the island where we got to see a bit more of the mountain in action, as well as some of the places where lava flows from previous eruptions have engulfed what were once smaller nearby islands. The views from the highest observation point, about half way up the mountain, were fantastic. 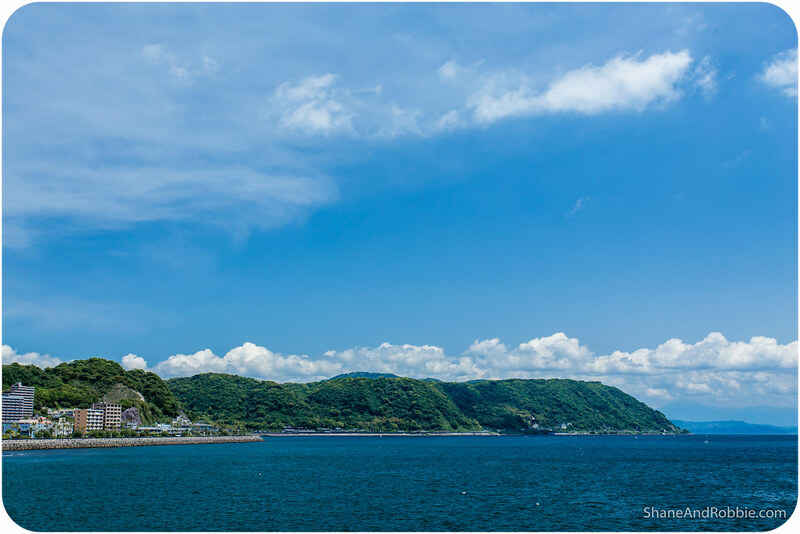 It was a fairly clear day and we could see all the way across to Kagoshima and up and down the coast for miles. 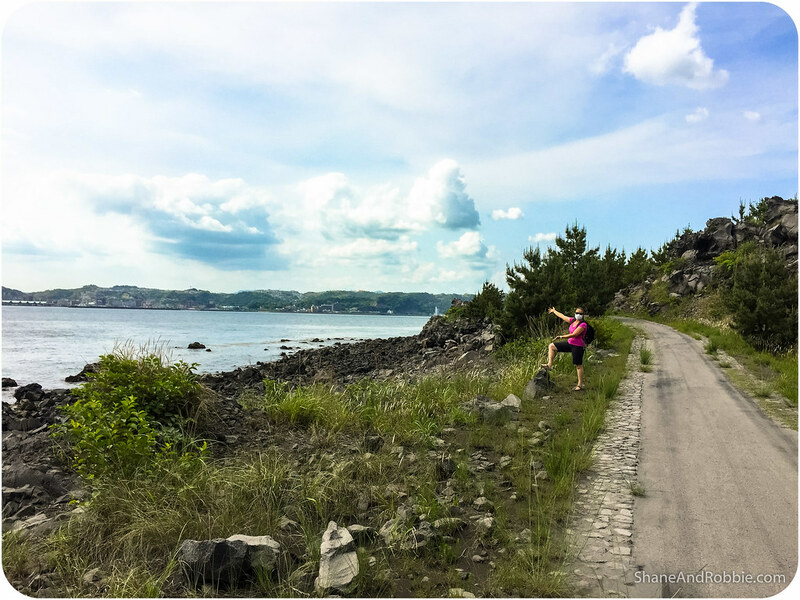 The sightseeing bus was packed* with people and by the end of the circuit we couldn’t wait to get off and have some space to ourselves, so we sought out the Nagisa Lava Trail and went for a walk around the Eastern edge of the island. 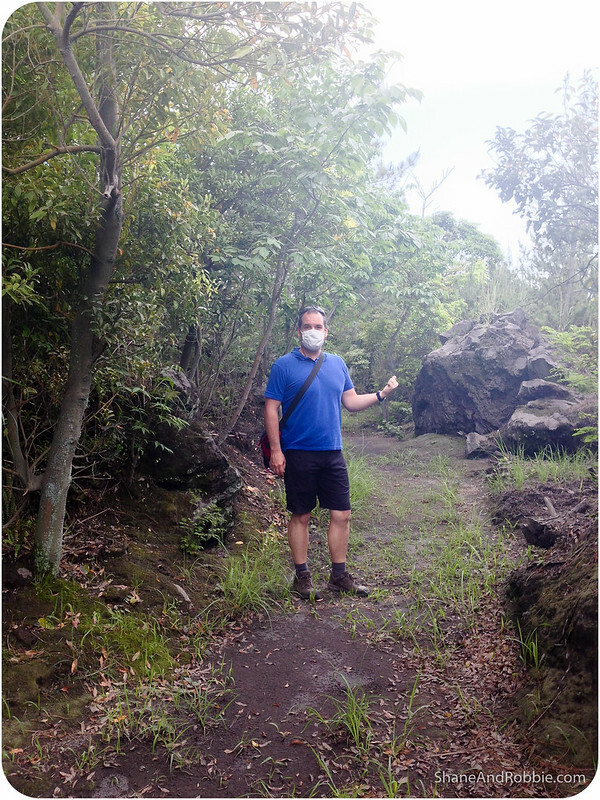 The trail cuts through the lava flow zone from the 1914 eruption and gave us a good chance to see more of the island’s rocks, vegetation, and sea-front. *That is “packed” by Asian standards, not by Aussie standards. Which means a lot of people (us included) standing up, no personal space, and a lot of time spent in people’s armpits if you’re short (i.e. me). Not as much fun as you might think on a hot, humid day. After our 2 hour walk around the lava flows and through the scrub, we were dirty, hot, sweaty, and most definitely ready to head home. And so we caught one of the regular ferries back across the bay to Kagoshima, watching the sunset paint Sakurajima golden as another great day on the road came to and end.